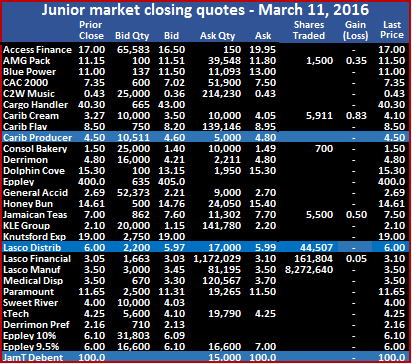 At the close, the junior market index fell 14.22 points to close at 1,904.71. The market ended with 18 active securities, 8 of which advanced and 5 declined as a mere 693,955 units changed hands, valued at $,269,270. There were 3 stocks closing with bids that were higher than their last selling prices and 2 ended with lower offers. In trading the market closed with one new high and one new low. 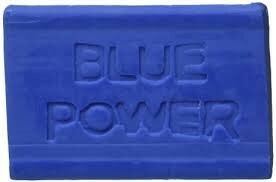 At the end, Blue Power closed with a gain of $1.05 at $14.05 with only 190 units changing hands, Caribbean Cream traded a mere 100 shares as the price lost 5 cents to end at $4.70, Caribbean Flavours had 1,000 shares changing hands to end at $7.56 for a 1 cent gain. 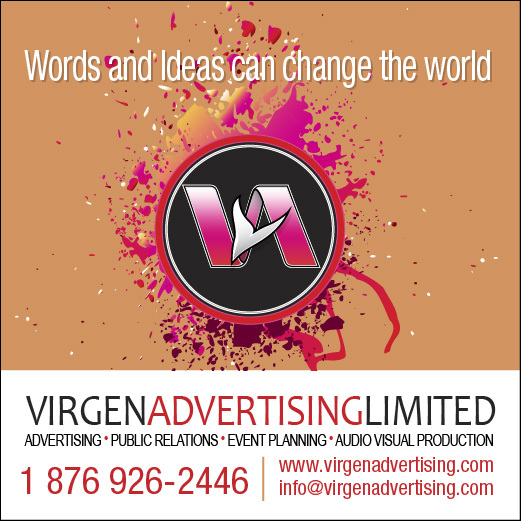 Caribbean Producers traded 23,418 shares to end with a loss of 60 cents at $4.10, Consolidated Bakeries had 40,482 units trading, with a loss of 1 cent to end at $1.24, C2W Music fell 4 cents with 6,600 units changing hands to close at a 52 weeks’ low of 33 cents. Honey Bun had 3,160 units trading but rose by 49 cents to end at $11.50, Iron Rock had 245 shares trading at $4, Jamaican Teas closed at $4 after trading 650 units to gain 20 cents. Jetcon Corporation closed at $2.90 after 129,320 shares changed hands, Key Insurance traded at a new high of $2.85 after rising 25 cents with 23,159 units changing hands. KLE Group closed at $1.65 with 100,000 shares changing hands, Knutsford Express closed with 350 units changing hands at $22, Lasco Distributors lost 5 cents and ended with 61,955 units trading at $5.60. Lasco Financial ended at $2.75 with 9,121 shares changing hands, for a loss of 25 cents, Lasco Manufacturing ended with 287,905 shares changing hands and gained 10 cents to close at $3.65, Medical Disposables closed with a gain of 12 cents with 1,000 shares trading at $3.42 and tTech gained 30 cents with 5,300 shares trading to end at $4.30. tTech plans releasing audited accounts for 2015 around the middle of April a source from the company advised IC Insider. the source indicates that the JSE advised that since they listed in January, after the year end the accounts to the end of December last year was not a requirement, the company decided to release the report when completed nevertheless. Key Insurance Company that listed on Thursday traded at $2.60 on Friday today above the Initial Public offering price (IPO) of $2.27. ISP Finance that was listed earlier in the week did not traded on Friday with a wide gap between the bid at $2.15 the offer price of $3, the stock traded at $2.50 on the opening day. Jetcon Coporation that was listed on the day before Easter, traded to close at $2.90, but went as high as $2.99 compared to the IPO price of $2.25. 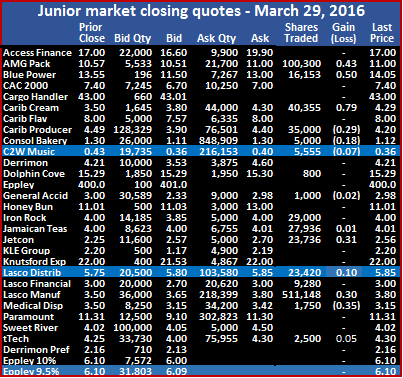 At the close, the junior market index fell 6.29 points being added to close at 1,918.93. The market ended with 21 active securities, 4 of which advanced and 10 declined as a mere 988,659 units changed hands, valued at $3,655,969. There were 4 stocks closing with bids that were higher than their last selling prices and 3 ended with lower offers. In trading, AMG Packaging closed with a gain of 10 cents at $11.10 with 27,099 units changing hands, CAC 2000 traded 1,000 shares and lost 47 cents to end at $6.53, Caribbean Cream traded 22,085 shares as the price rose 35 cents to end at $4.75, Caribbean Flavours had 5,300 shares changing hands to end at $7.55. Caribbean Producers traded 3,000 shares to end with a loss of 10 cents at $4.70, Consolidated Bakeries had 29,073 units trading, with a rise of 10 cents to end at $1.25, C2W Music fell 3 cents with 4,000 units changing hands to close at 37 cents. 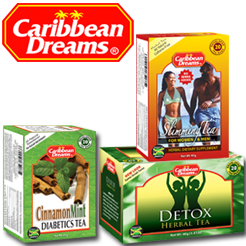 Derrimon Trading closed with 950 shares changing hands as the price slipped 21 cents to end at $4, Honey Bun had 26,150 units trading but lost 2 cents to end at $11.01, Iron Rock had 5,000 shares trading at $4, Jamaican Teas closed at $3.80 after trading 28,510 units. Jetcon Corporation closed at $2.90 after trading 306,956 shares, Key Insurance traded at a new high of $2.60 as 40,000 units changed hands with the price gaining 33 cents on the IPO price. KLE Group dropped 45 cents to close at $1.65 with 201,343 shares changing hands, Knutsford Express closed with 119 units changing hands to end at $22, Lasco Distributors lost 15 cents and ended with 177,390 units trading at $5.65. Lasco Financial ended at $3 with 7,077 shares changing hands, Lasco Manufacturing ended with 60,107 shares changing hands to close at $3.55, with a loss of 15 cents, Medical Disposables closed with a loss of 12 cents with 18,000 shares trading at $3.30 and tTech fell 48 cents with 17,500 shares trading to end at $4. 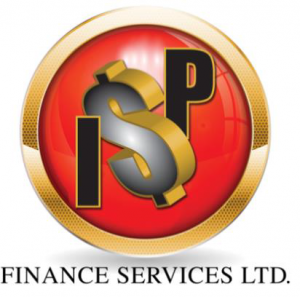 ISP Finance was listed on Wednesday and closed trading at $2.50 after listing at $2. 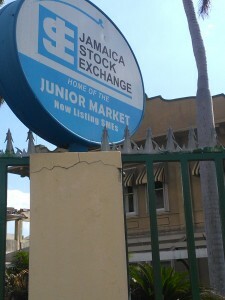 The new listing brought the junior market listings to 31 while the listing of Key Insurance on Thursday will bring the total to 32. Jetcon Coporation that was listed on the day before Easter traded to close at $2.80, the stock was offered to the public at $2.25. 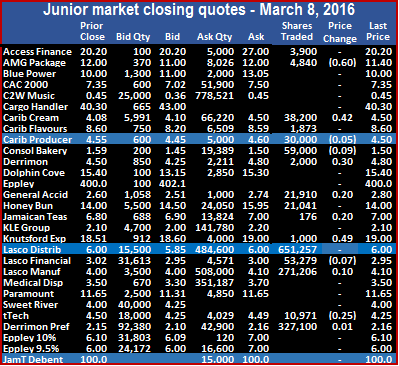 At the end of trading on Wednesday, the junior market index dropped 38.69 points to close at 1,894.76. The market ended with 19 active securities, 6 of which advanced and 8 declined as 2,476,908 units changed hands, valued at $8,795,980. At the close, three stocks closed at new highs while there were 3 stocks closing with bids that were higher than their last selling prices and 6 ended with lower offers. In trading, AMG Packaging closed at $11 with 4,101 units changing hands, Blue Power had 7,267 shares trading but lost $1.05 to close at $13. CAC 2000 lost 40 cents in trading 6,800 shares at $7, Caribbean Flavours fell 43 cents with 5,000 shares changing hands to end at $7.57. Caribbean Producers traded 32,200 shares to end at $4.20 Consolidated Bakeries had 100,000 units trading with a loss of 7 cents to end at $1.05, Dolphin Cove had 1,850 units changing hands at 79 cents lower at $14.50. 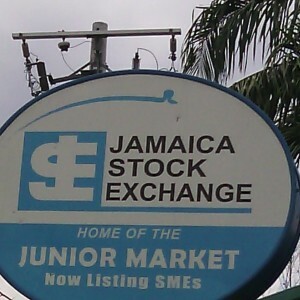 Honey Bun traded just 3,185 shares and gained 2 cents in closing at $11.03, Iron Rock had 163,004 shares trading at $4, ISP Finance traded 10,250 shares at a record high of $2.50 after adding 50 cents from the initial offered price of $2, Jamaican Teas lost 15 cents in closing at $3.85 after trading 121,235 units. Jetcon Corporation traded at a new high to close at $2.80, after trading at $2.90 and ended with a gain of 24 cents while 163,973 shares were traded, Knutsford Express closed with 1,429 units changing hands to end at $22, Lasco Distributors lost 5 cents with 21,300 units trading, to end at $5.80. Lasco Financial ended at $2.65 with 52,600 shares changing hands after shedding 35 cents, Lasco Manufacturing ended with 1,688,914 shares changing hands to close at $3.80, with a rise of 30 cents, Medical Disposables rose 27 cents and closed with 800 shares trading at $3.42. Sweet River traded 92,000 shares and gained 3 cents to end at a new high of $4.05 and tTech gained 18 cents, in trading 1,000 shares at $4.48. Jetcon Coporation that was listed on Thursday last traded for the first time up to $2.58 with moderate volume. The stock was issued to the public at $2.25 in the initial public offering. At the end of trading on Tuesday, the junior market index rose a strong 2.76 percent with 51.92 points being added to close at 1,933.45. The market ended with 16 active securities, 8 of which advanced and 5 declined as 832,933 units changed hands, valued at $4,034,146. At the close, there were 5 stocks closing with bids that were higher than their last selling prices and 4 ended with lower offers. In trading, AMG Packaging gained 43 cents and closed at $11 with 100,300 units changing hands, Blue Power had 16,153 shares trading but rose 50 cents to end at a 52 weeks’ high of $14.05. Caribbean Cream rose 79 cents with 40,355 shares changing hands to end at $4.29. Caribbean Producers lost 29 cents in trading 35,000 shares to end at $4.20 Consolidated Bakeries had 5,000 units trading with a loss of 18 cents to end at $1.12, C2W Music lost 7 cents to close at 52 weeks’ low of 36 cents while trading 5,555 shares, Dolphin Cove had 800 units changing hands at $15.29. General Accident traded just 1,000 shares but lost 2 cents in closing at $2.98, Iron Rock had 29,000 shares trading at $4, Jamaican Teas closed at $4.01 after trading 27,936 units for a gain of 1 cent, Jetcon traded 23,736 shares with a rise of 31 cents to $2.56, for a closing high. Lasco Distributors gained 10 cents with 23,420 units trading, to end at $5.85, Lasco Financial ended at $3 with 9,280 shares changing hands. Lasco Manufacturing ended with 511,148 shares changing hands to close at $3.80, with a rise of 30 cents, Medical Disposables fell 35 cents and closed with 1,750 shares trading at $3.15 and tTech gained 5 cents, in trading 2,500 shares at $4.30. Shares in ISP Finance Services will list on the junior market on Wednesday when trading in the shares is expected to commence. 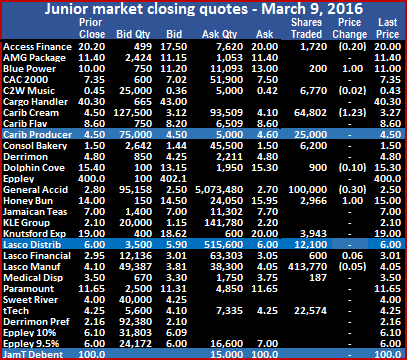 The junior market rose Monday but with declining stocks being just ahead of advancing ones. The market ended with a gain of 27.76 points to close at 1,914.73 on Monday. The market ended with 11 securities trading, 5 of which declined and 4 advancing and 811,127 units changing hands, valued at $3,604,853. The decline in the market seems over with IC bid offer indicator pointing to rising prices ahead on Monday. At the close, 1 security ended with no bid and only 6 securities had no stocks being offered for sale. There were 4 stocks closing with bids that were higher than their last selling prices and 1 ended with lower offer. In trading, AMG Packaging lost 35 cents with 14,101 units changing hands, to close at $11.15, Caribbean Cream traded 117,959 shares, the price slipped by 4 cents and ended at $4.06, Caribbean Producers lost 35 cents to end with 102,139 shares trading at $4.15. General Accident closed with only 9,000 shares being active but gained 1 cent to end at $2.70, Honey Bun traded 13,054 units at $14 after shedding 61 cents. 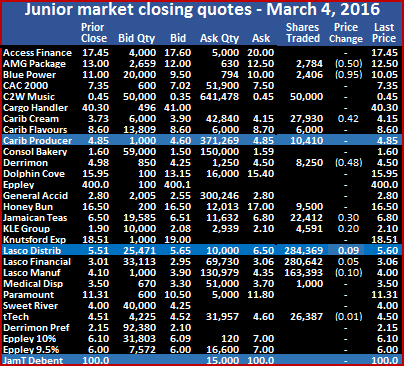 Jamaican Teas gained 20 cents in closing at $7.70 with 2,801 shares changing hands. Lasco Distributors closed with 121,420 units trading to end at $6, Lasco Financial fell by 9 cents to end at $3.01 with 90,849 shares changing hands, Lasco Manufacturing ended with 223,804 shares changing hands to close at $3.50. Sweet River ended with 11,000 units changing hands at $4.02 after rising 2 cents for a 52 weeks’ high and tTech closed with a gain of 25 cents at $4.50 with 105,000 units changing hands. Mayberry Investments made $2.3m from Lasco Trades in 2 days. 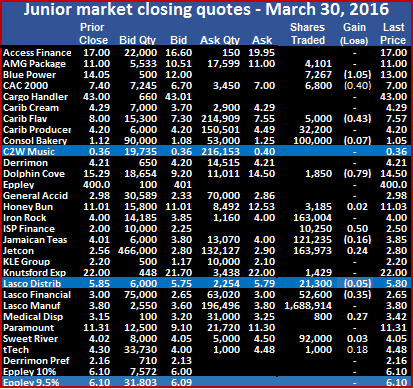 The junior market has fallen to its lowest point since 2,357.20 points at the close on January 12 this year. To the end of Friday the market lost 19.95 percent as it suffered the third day of losses. The highlight of the day was Lasco Manufacturing that had another high volume traded to close unchanged as Mayberry was involved in a cross for most of the shares that traded buying 8 million units for in house purposes at $3.20. 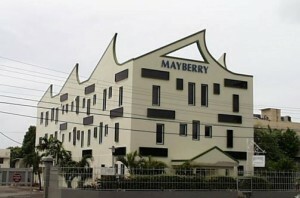 On Thursday Mayberry sold 7.82 million units of the stock from in house inventory, at $3.50 or better, pocketing a profit of $2.3 million as a result of the two days of trading in the stock. The slippage in the price of Lasco Manufacturing was the main contributor the fall in the market index over the two days. The market suffered a third day of fall by dropping 24.68 points fall on Wednesday to end at 1,886.97. With only 7 securities trading, none declining and 4 advancing. The market ended with 8,492,562 units changing hands, valued at $27,397,677 but with the exception trades for the three Lasco companies, volume was extremely low. The decline in the market seems over with IC bid offer indicator pointing to rising prices ahead on Monday. At the close, 1 security ended with no bid and only 6 securities had no stocks being offered for sale. There were 9 stocks closing with bids that were higher than their last selling prices and 4 ended with lower offers. In trading, AMG Packaging rose 35 cents with only 1,500 units changing hands to close at $11.50, Caribbean Cream traded 5,911 as the price rose 83 cents to end at $4.10, Consolidated Bakeries traded just 700 units to end at $1.50, Jamaican Teas gained 50 cents in closing at $7.50 with 5,500 shares changing hands. Lasco Distributors closed with 44,507 units trading to end at $6, Lasco Financial gained 5 cents to end at $3.10 with 161,804 shares changing hands and Lasco Manufacturing ended with 8,272,640 shares changing hands to close at $3.50. 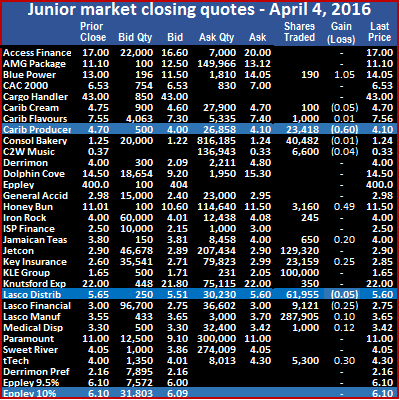 The junior market closed on Wednesday with advancing stocks having the upper hand on decliners, with low volume of stocks changing hands but with a heighted number of securities being active. The market dropped 48.02 points to end at 1,965.53, with 15 securities trading, of which 6 declined and 3 advanced. The market ended with 661,732 units changing hands, valued at $2,524,696. At the close, 1 security ended with no bid and only 5 securities had no stocks being offered for sale. There were 4 stocks closing with bids that were higher than their last selling prices and one ended with a lower offer. In trading, Access Financial Services ended with 1,720 units changing hands at $20 after losing 20 cents, Blue Power rose by $1 with 200 units changing hands to close at $11, C2W Music had 6,770 shares trading with the loss of 2 cents to end at 43 cents, Caribbean Cream fell $1.23 to close at $3.27 with 64,802 units trading. 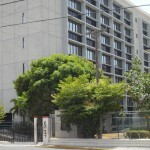 Caribbean Producers had 25,000 units changing hands to close at $4.50, Consolidated Bakeries traded 6,200 units to end at $1.50, Dolphin Cove ended with a loss of 10 cents to close at $15.30 while trading just 500 units. General Accident fell 30 cents in closing at $2.50 with 100,000 shares changing hands, Honey Bun rose $1 in trading 2,966 shares to close at $15, Knutsford Express traded 3,943 shares at $19. Lasco Distributors closed with 12,100 units trading to end at $6, Lasco Financial gained 6 cents to end at $3.01 with 600 shares changing hands, Lasco Manufacturing ended 5 cents lower in trading 413,770 shares to close at $4.05, Medical Disposables traded 187 shares at $3.50, tTech traded 22,574 shares to close at $4.25. Knutsford Express traded at a new all-time high of $19 on Tuesday. 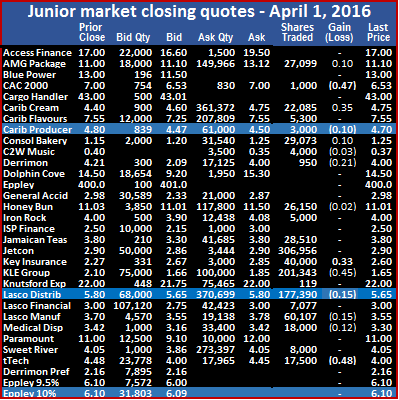 The junior market closed on Tuesday with advancing stocks having the upper hand on decliners, with low volume of stocks changing hands but with a heighted number of securities being active. The market rose 14.37 points to end at 2,013.55 with 16 securities trading of which 5 declined and 7 advanced. The market ended with 1,497,753 units changing hands, valued at $7,035,386 and with 1 stock closing at a 52 weeks’ high and one at an intraday high. At the close, 1 security ended with no bid and only 3 securities had no stocks being offered for sale. There were 3 stocks closing with bids that were higher than their last selling prices and none ended with lower offers. In trading, Access Financial Services traded at an intraday 52 weeks’ high of $21, but fell back to close at $20.20 with 3,900 units changing hands. AMG Packaging had 4,840 units changing hands for a loss of 60 cents, to close at $11.40, Caribbean Cream gained 42 cents to close at $4.50 with 38,200 units trading, Carib Flavours had 1,873 units changing hands at $8.60. Caribbean Producers had 30,000 units changing hands to close with a loss of 5 cents at $4.50, Consolidated Bakeries traded 59,000 units but lost 9 cents to end at $1.50, Derrimon Trading ended with a gain of 30 cents to close at $4.80 while trading just 2,000 units. General Accident gained 20 cents in closing at $2.80 with 21,910 shares changing hands, Honey Bun traded 21,041 shares to close at $14, Jamaican Teas rose 20 cents and ended with 176 units changing hands at $7, Knutsford Express traded 1,000 shares and gained 49 cents to close at a 52 weeks’ high of $19. Lasco Distributors closed with 651,257 units trading to end 40 cents higher at $6, Lasco Financial fell 7 cents to end at $2.95 with 53,279 shares changing hands, Lasco Manufacturing ended 10 cents higher in trading 271,206 shares to close at $4.10, tTech lost 25 cents in trading 10,971 shares to close at $4.25 and Derrimon Trading 11.75% preference share traded 327,100 units at $2.16 after adding 1 cent. 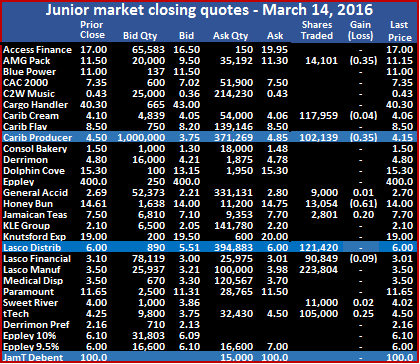 The junior market eked out a moderate gain on Thursday with advancing stocks just inching out declining ones by the narrowest of margins. The market rose 16.90 points to end at 1,959.95 with 14 securities trading of which 4 declined and 5 advanced. The market ended with 1,023,326 units changing hands, valued at $4,965,280. At the close, 1 security ended with no bid and 5 securities had no stocks being offered for sale. There were 8 stocks closing with bids that were higher than their last selling prices and 3 ended with lower offers. In trading, Access Financial gained 95 cents in trading 13,701 units to close at $16.50, AMG Packaging closed with 33,944 units changing hands at $13, Blue Power ended with 5,315 shares changing hands at $11, CAC 2000 traded with a loss of 1 cent to close at $7.35 with 8,703 units. 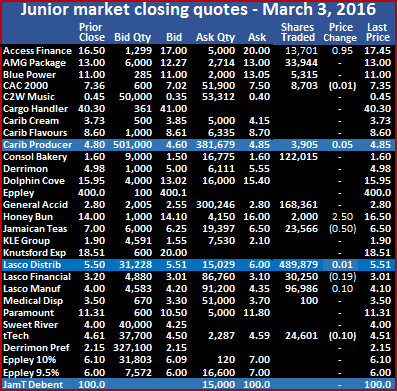 Caribbean Producers had 3,905 units changing hands to close with a gain of 5 cents at $4.85, Consolidated Bakeries traded 122,015 units to closed at $1.60, General Accident traded 168,361 units to end at $2.80, Honey Bun gained $2.50 in trading just 2,000 shares to close at a 52 weeks’ high of $16.50. Jamaican Teas lost 50 cents, ending with 23,566 units changing hands at $6.50, Lasco Distributors closed with 489,879 units trading, to end 1 cent higher at $5.51. Lasco Financial fell by 19 cents to end at $3.01 with 30,250 shares changing hands, Lasco Manufacturing ended trading with 96,986 shares to close at $4.10 after rising 10 cents, Medical Disposables traded 100 units and closed at $3.50 and tTech traded 24,601 shares to close with a loss of 10 cents at $4.51.